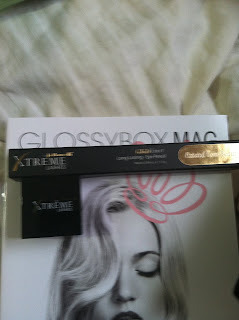 The second box I signed up for was the Glossybox. When I received it they had a card in there since it's their 1 year anniversary in the States. This is my first Glossybox. I'm still getting used to doing some type of reviews, so bare with me please. I'll post the picture then the price, and underneath I'll post my thoughts, likes, dislikes, etc about the product. The first product I pulled out is the Xtreme Lashes GlideLiner Long Lasting Eye Pencil along with the sharpener that goes with it. Full size: $29.00/ .04OZ. 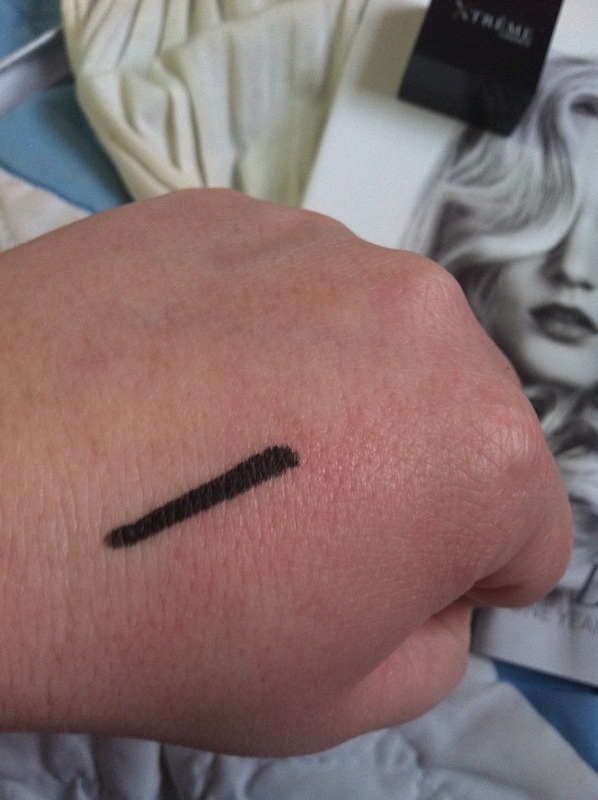 I don't usually like pencil type eyeliners; however this eyeliner literally glided on. It wasn't sharp, I didn't have to go over certain spots, it went on smooth and lasted the whole day. I really like this eyeliner, and even though it's a bit pricier I will be purchasing it once I use this one all up. Very happy with this product. This is Epionce Intense Defense Anti-Aging + Repair Serum. 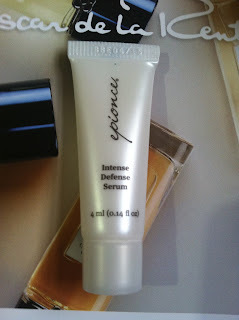 Full size: $136.00/ 30ML. I just turned 25 on Sunday, and I was already having a slight panic attack thinking "OMG I'm old." Then I got this in my Glossybox. I'm not one for anti aging products, not saying I don't like them, I just don't prefer using them at this time. I have to honestly say that I would never buy this, I'm a mom, if I'm going to spend that type of money on a product it will be a product for my child. 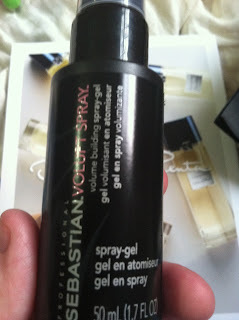 The next product was this Sebastian Professional Volupt Spray. Full Size: $19.95/ 5.07 FL OZ. I tried it, and I do like it; however I find the smell is more like a hairspray smell. It's supposed to add volume to your hair, I liked the feel of it. It was light and didn't make my hair feel greasy or anything. 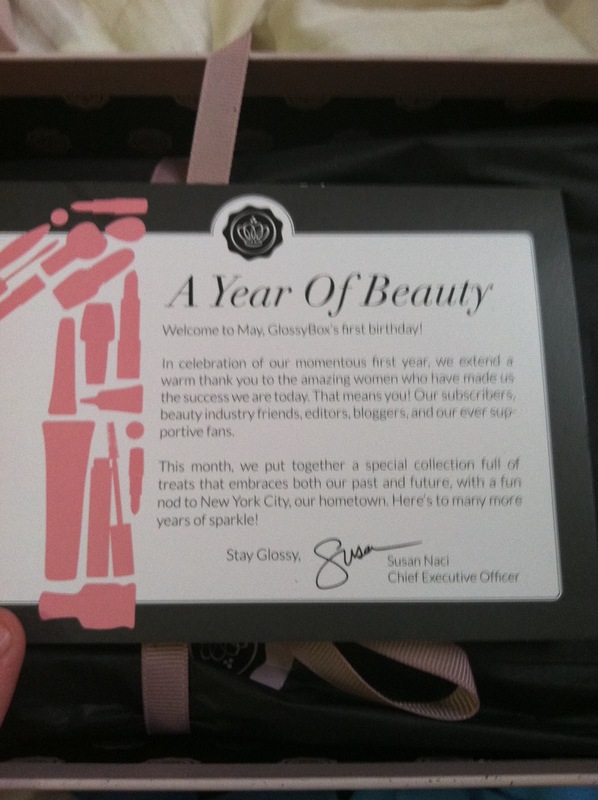 Glossybox also included a coupon in the box for a Sebastian Professional product, I may use it. I loved the packaging and was super excited to try it. It's basically a perfume stick type. I put it on and wasn't that impressed with the scent. The one I received smells like laundry soap. :/ I will purchase this in the future, but it will be a different scent for sure. European Wax Center Body Wash Full Size :$20.00/ 8OZ and Slow It Body Lotion Full Size: $20.00/ 8OZ. 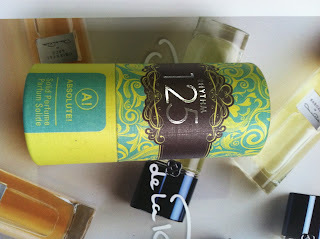 I haven't tried them yet, but I will soon and I enjoy trying new body washes and lotion and finding favourites to buy. 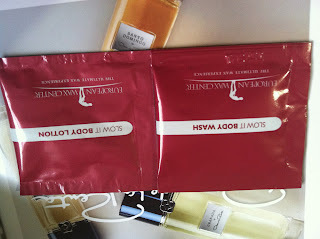 The last thing I got was the Etre Belle Collagen & Aloe Vera Hydro Mask. 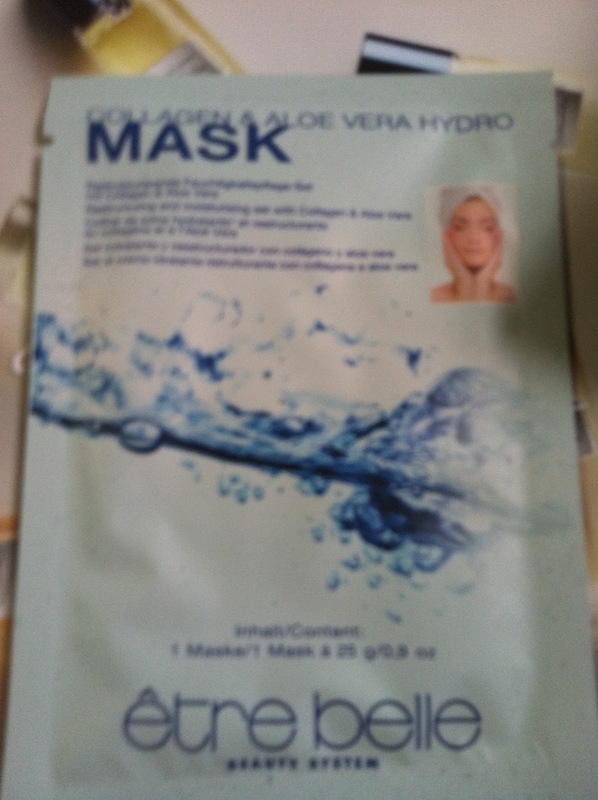 Full Size: $39.50/ 10 Masks. I don't usually use mask type beauty products. So I'm on the fence about this. In the packet it feels gooey for a lack of better terms. Overall I'm happy with my Glossybox. I liked the packaging and the timely manner it was sent out in. I'm just late writing about it and uploading the pictures lol. Glossybox is $21 a month, and once you save up 1000 GlossyDots you earn a FREE Glossybox. 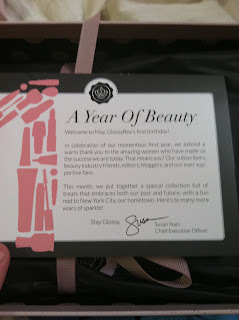 Sign up for Glossybox if you're interested. June's doing a special Beauty Box, which I'm excited for :). The blogger follow button is leading me to a foreign website. 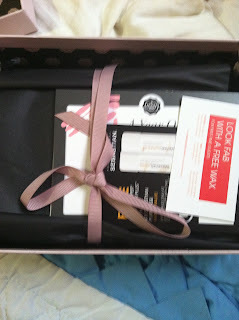 Glossybox sounds like fun!